Partly because television is afforded a wide net to expand or constrict its emotive output, but mostly because time heals/ruins all, an average two-hour time for a movie just cannot match the unfolding nature of a television program or, god forbid, a novel. The unscripted nature of reality television translates to the screen as ‘slice-of-life,’ virtually ignoring (save exposition) the setting before and after the film’s direct action sequences, but because of its constraints there can be no other way to tell a story. If we expand this notion, television and books act similarly, but the film medium, unlike any other, cuts in and out of time and deliberately expresses its message without frills or expectation. It is the essential aspect of film and deft filmmakers will achieve purpose though bounded by this constraint. I am unsure at what point in recorded history, or between which points exactly, film’s audience depressed its desire for romanticism in favor of realism. At some point in the first half of the 2oth century, whether it be technical or political limitation, film tended to focus on the distinction between serial drama and reality. From many angles, this method, cured and pruned, achieved success as allegory came to represent reality; almost any of the films I’ve previously reviews pre-1960 tend to be set in real-life places and times but with heavily fictionalized events or historical facets satirized and reworked as to remove the viewer from this experience and tell a story free of the constricting horror of life. We can theorize why this began to shift but in the late 1950s – 1958 to be exact – New Wave movements depicting cinéma vérité (“true” film) attempted to create a form of authorship investment in the film. Vérité‘s audiences were to experience action as if it would document each person’s individual history; it purposefully blurs “real” life and fictitious events in a documentary style. It is intended that the audience a. knows this fact but b. cannot differentiate. It is a meta-filmstyle, mirroring its own setting. 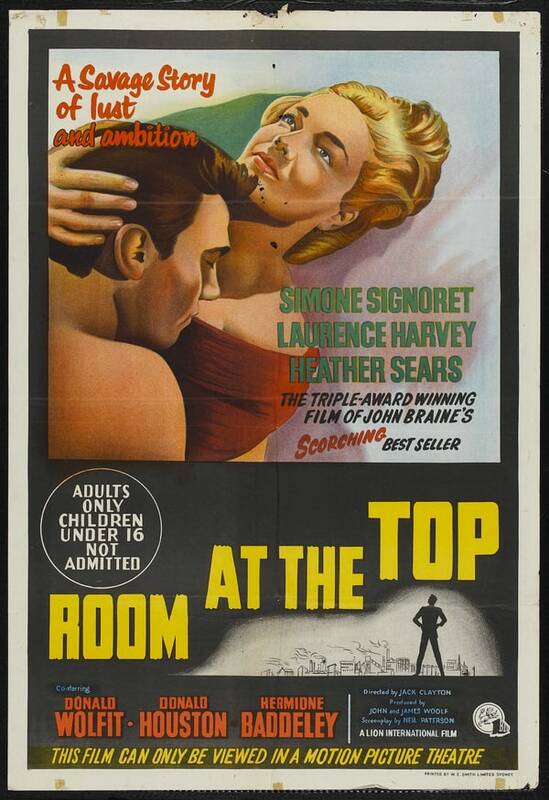 Differences across cultures affect(ed) the manner in which films disseminate story, but 1959’s Room At The Top is a quintessential representation of British New Wave and, even as 55 years have limited its immediacy, we, audience, relate to the powerful themes in this story, not vicariously, but vividly. Incorrigible sycophant Joe Lampton wishes to be more than his pedigree prescribes him, so he purposefully and deliberately stomps on his peers and his “betters” to become magnate. This, in a very sentence, is the plot, hook line and sinker for Room At The Top. He is written to be deliberately unlikable – those who recognize this have been stepped on and those who do not have done the stepping – and for the blurry nature of time to have whittled away his expectations. At one point or another those who a. recognize the concept of cinéma vérité and b. have experienced this type of emotional upheaval can not only watch and take from the film a sense of understanding and meaning, but truly insert themselves into the situation. It is a simulcast experience and close read. This Joe Lampton is not an everyman, for the everyman is instantly relatable. He is neither a representation nor a foil of an ideal or a metaphor or an allegory for any other representation or foil. Instead, Joe Lampton exists for us to judge our own experiences against his, to learn from his actions what consequences are, not what they should or could be. Joe Lampton is not an everyman because every man has his own self, his own ambitions and his own morals and values and goals. Joe Lampton is a binary; he is either you or not you and, if I extrapolate, I assume that this is how most New Wave films are structured. As a composite, the collection of these types of films would certainly aggregate as a relatively comprehensive package of man as he is, not the man director Jack Clayton expects us to make of him. Perhaps overshadowing Room At The Top‘s film-as-life is Simone Signoret’s performance as one of Lampton’s harpooned lovers, Alice Aisgill. Slightly too old, too poor, too sad, too damaged, too entrapped, Alice is the definition of perfection to many romantics because what she lacks in outward she survives on inward; l’amour she would call it is a very French ideal, loosely aligning with the origin of New Wave in Truffaut’s France around the turn of the seventh decade. Mythos aside, Alice is also the exact opposite of the superficial object of affection, Susan Brown – who is too young, too rich, too naive, to giddy and too untouched to make a lover for the man who has no idea that he wants none of it. These women are binary representations of ideas, but vérité makes them as close to document as possible. Alice’s unfettered rawness is a highlight of not only Room At The Top, but of all New Wave and most certainly of film’s golden performances. It is only too real to have this person enter and exist our, the audience’s, lexicon through the side door of our unconscious. Just as this project is not an exhaustive attempt to rank or order great films based on trumped criteria, it is also as unfortunate that films like Room At The Top are buried beneath the behemoth that is deserving, but overrated Ben-Hur, which captured 1959’s top prize. Unfortunately, Ben-Hur‘s lore dramatically overshadows the other four films, which include The Nun’s Story (Audrey Hepburn/Fred Zinneman winning combination), The Diary of Anne Frank (why? ), and Anatomy of a Murder (probably a fantastic courtroom drama) and our Room At The Top, whose Britishisms certainly helped to preclude it from a win.